Wow, it has been six days since my last entry. My longest break from Xanga in a long, long time, and one that was very much enjoyed. So much of my work is done on the computer that when I combine it with recreational computer use, it seems like I’m plugged in online too much of my time. The weekend completely unplugged and week mostly away from recreational computer use has reminded me of the importance of establishing some boundaries in terms of how much, and when, I use computers and the internet. 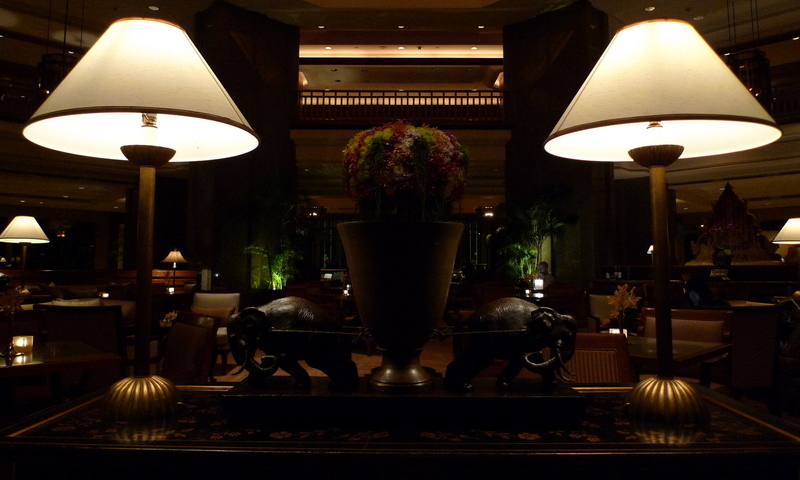 As for the two-night staycation at the Peninsula Hotel on the west side of the river here in Bangkok, it was fantastic. The hotel truly is world-class with wonderful service. It is very easy to spend three days in a cocoon and not really feel like you’re in the heart of the city, although from the balcony of the room, you could see that we were. Upon check-in we were upgraded from the “Deluxe” room (funny how the lowest grade of room is usually given a fancy name) to a balcony room, which is two rungs up the ladder. All the rooms in the hotel face the river, laid out along one side of a W-shaped floor plan. Our room was very spacious, about 60 square meters or about 600 square feet. There was a separate walk-in closet/dressing room and then a large bathroom beyond the bedroom, making it feel especially spacious. 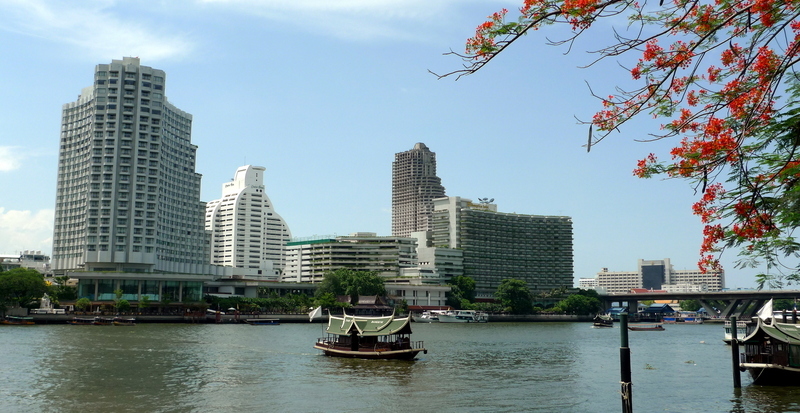 The Chao Phraya River runs past most of the nicest hotels in the city, including the Shangri-La (pictured here), Sheraton, Oriental, Hilton, Peninsula, and Marriott Resort. For sightseeing, the location of these hotels is a little less convenient. But if you’re staying at one of these places you can probably afford to hire a car and driver for the day, so convenience isn’t that much of a problem. The hotel has a gorgeous swimming area, spa (the building behind the pool), and workout facility. The first afternoon we headed down to the pool but a typical afternoon thunderstorm quickly blew in, with winds gusting in advance of the rain, causing umbrellas to overturn and towels and chair pads to go flying into the pool. The remainder of the weekend had gorgeous weather, though, and we spent much of Saturday afternoon laying in the shade below one of these pavilions, sipping mango smoothies and reading. 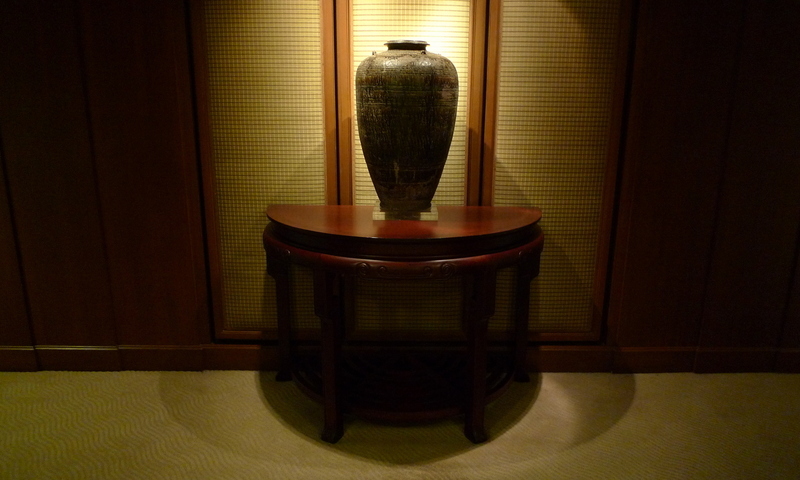 The hotel’s interior design is very beautiful. Clean lines with an Asian theme but not in an overwhelming “Oriental” way. The main lobby, where we stopped for a pre-dinner drink the first night, is very comfortable. 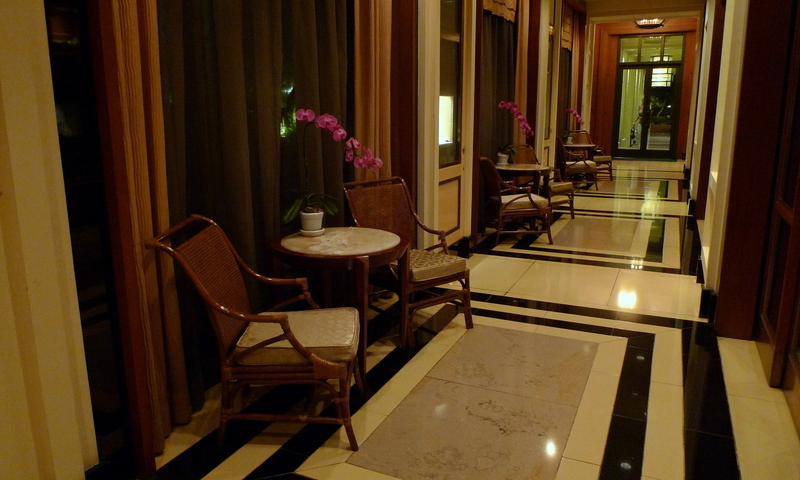 Even the public hallways, this one leading to the River Cafe and Terrace, are tastefully decorated with live orchids. Friday evening we ate outdoors alongside the river. The full moon was rising just behind the tower at the Shangri-La Hotel. I’m amazed by how busy the river is even well into the evening. Our room rate included a set dinner for two but since their occupancy is fairly low, they were serving a buffet. It was actually a cleverly done buffet, offering a large range of prepared dishes that could be served at or near room temperature – salads, cold cuts, etc. – with soups, fresh seafood, a wide selection of breads, etc. to round it out. The main feature was their grill. They offered a wide range of meats from seafood to satay to fine cuts of beef, lamb, and pork, grilled to order and served with a variety of sauces. This is actually a very smart way to do a buffet as there is much less waste. 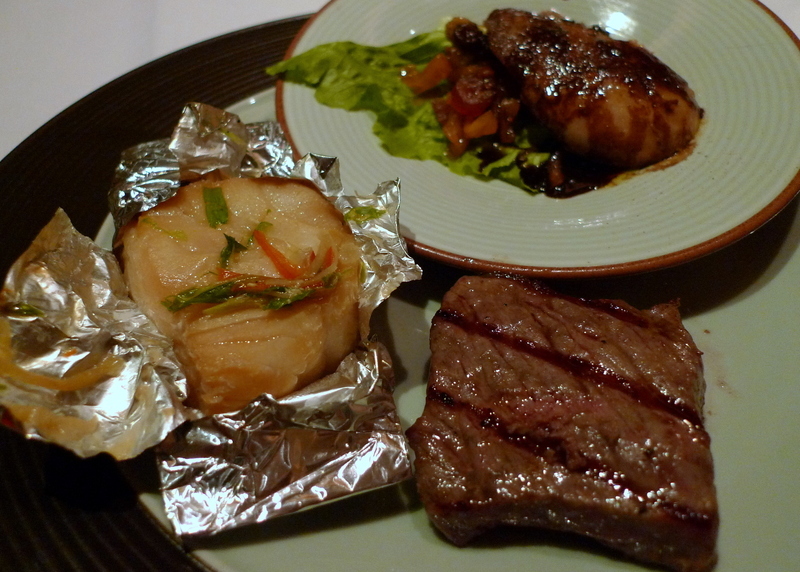 My selections included a cut of snowfish grilled in a foil pouch with ginger and other seasonings, a very tender cut of Wagyu beef, and some foie gras. 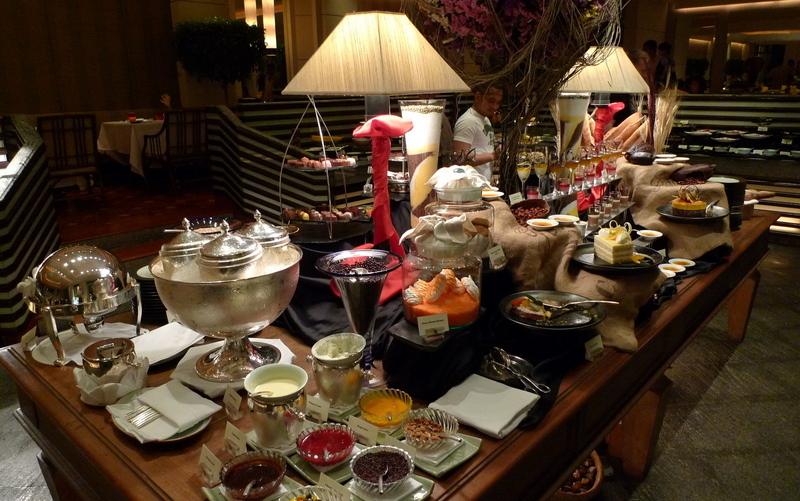 There was a large dessert bar in the center of the dining room featuring all sorts of desserts and fresh fruit. There were three flavors of homemade ice cream including both raspberry and mango sorbets that were amped up with flavor. 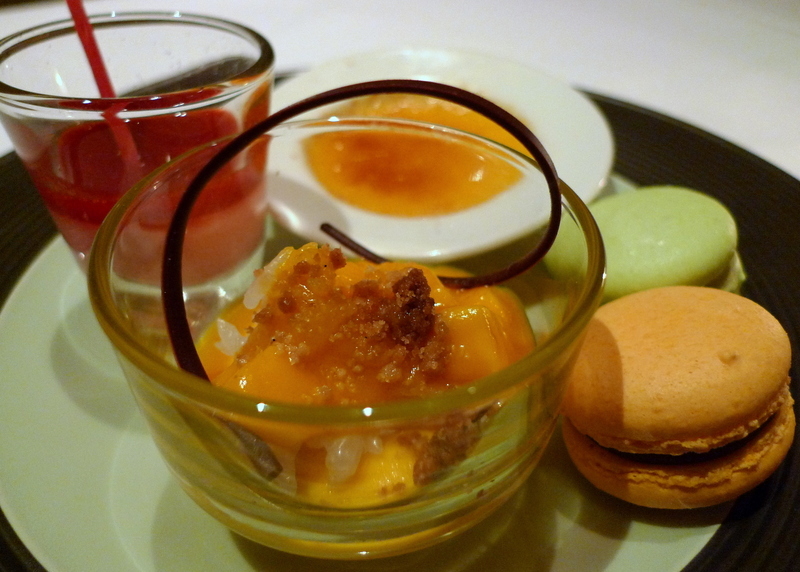 A selection of desserts: a raspberry mousse, a ginger creme brulee, green tea and chocolate-orange macarons, and an interesting twist on sticky rice and mango that included a mango mousse. Both evenings we retired to the room to watch episodes from season two of True Blood, the southern vampire series based on the novels by Charlaine Harris. Since we don’t have HBO here in Thailand, we haven’t been able to watch the series in real time. And since I generally don’t want to support piracy, I’ve waited patiently until the episodes were released on iTunes Store instead of buying them on the street. 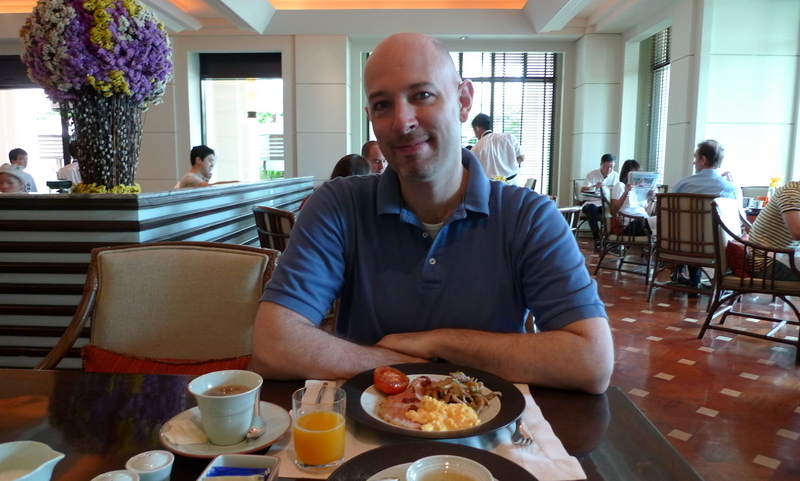 The breakfast buffet was also included, featuring just about everything you might want for both Asian and Western style breakfasts, including to-order egg dishes. 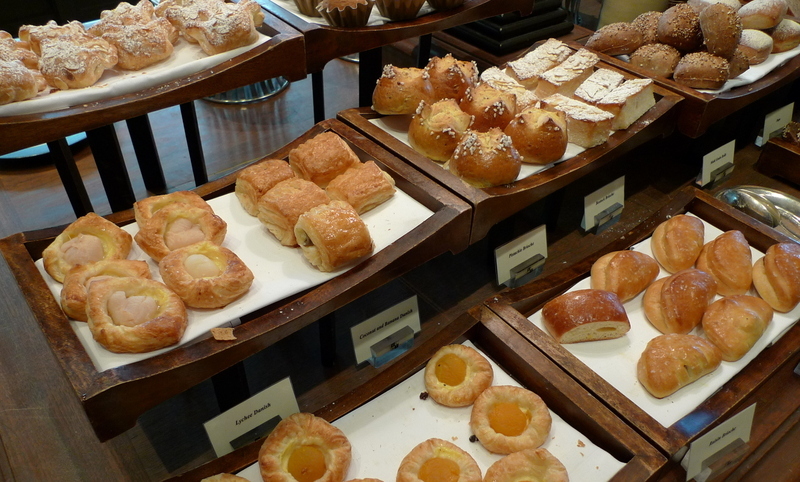 The pastries were really nice. Could I just have eaten one of everything and called it a day? 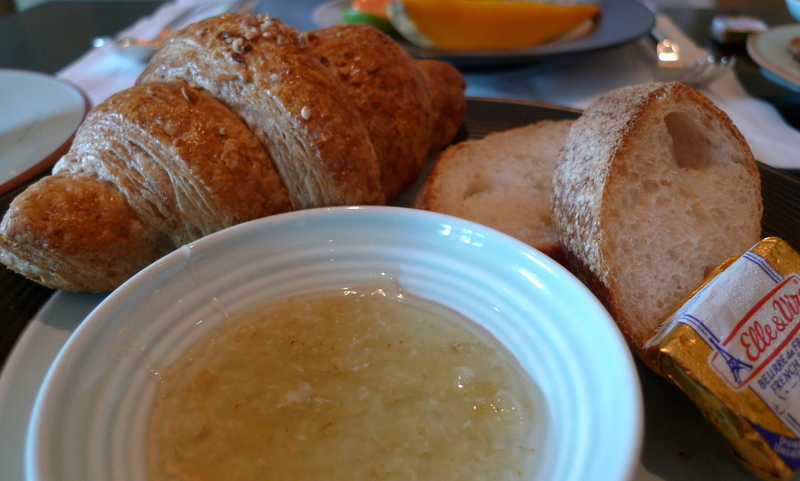 The bread was amazing, perhaps the best European style bread I’ve found in Bangkok. They also served raw honey fresh from the honeycomb, with the comb hanging on the table with the honey dripping down a trough and into a bowl. Enjoyinga healthy breakfast! The service was very attentive and we got into a discussion with one of the restaurant managers about the silver tea service they use, a design that Tawn has had his eye on. The manager took his name and number and called him a few days after the trip, connecting him with an unofficial resource to buy his own set. Shhh! Don’t tell anyone. 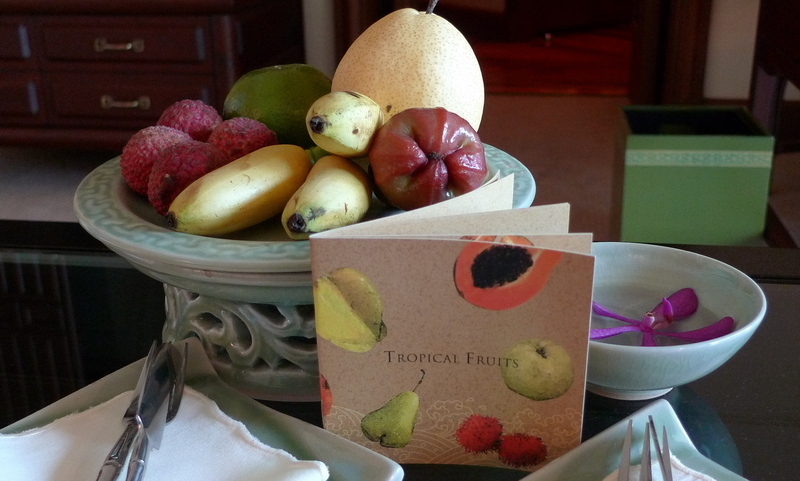 The tropical fruits were the finishing touch, though. I don’t know where they buy their fruits but the mangos were the tastiest, sweetest mangos I’ve eaten in Thailand and the dragonfruit, which I usually find quite bland, was actually full of flavor. By the time we checked out Sunday at noon, we had de-stressed quite a bit, promising ourselves that we would do more weekend getaways in the months to come. What’s the point of living in a tropical paradise if you don’t get out to enjoy it? 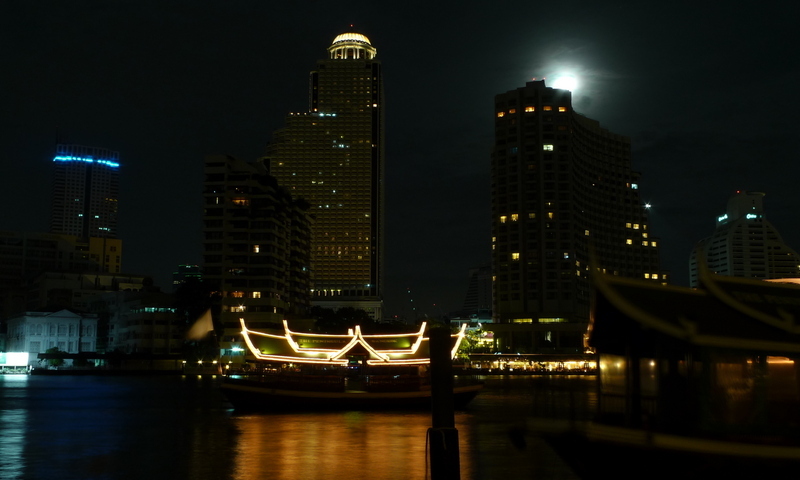 This entry was posted in Uncategorized and tagged Bangkok, hotel, Krungthep, Peninsula, Staycation, Thailand by christao408. Bookmark the permalink. What a great staycation it looked like! =) As always your pictures look soo good, esp. 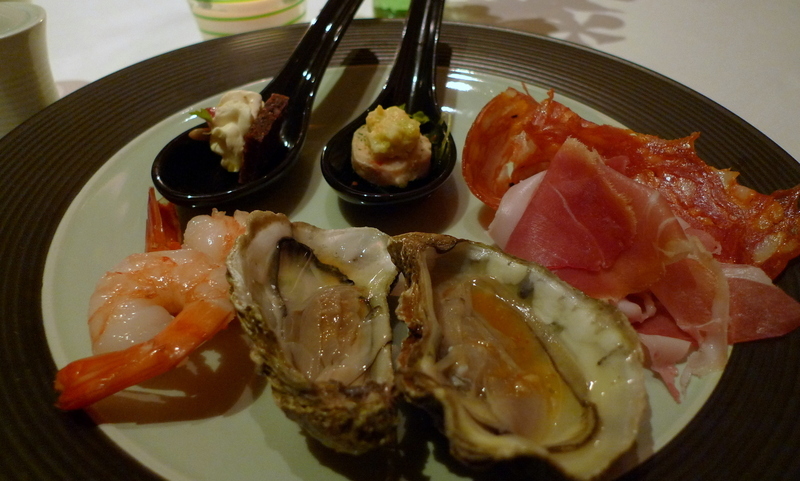 the seafood from the buffet!! It’s nice to enjoy such luxury once in a while to truly relax. I also wanted to add that I am against piracy as well. I either buy the cd or dl off itunes. I raided the HMVs when I was Singapore–they seem to be a dying breed here in North America, but in Asia the seem to be going strong still. That was a good staycation. Oh, very nice meal and room at the Peninsula! I like their location too, because that’s away from the touristy side of town. And enjoyed the ride across the river on their boats!You last photo brought back fond memories of my breakfasts over there. How do you like the bedside control where you can play with the curtains and light switches? 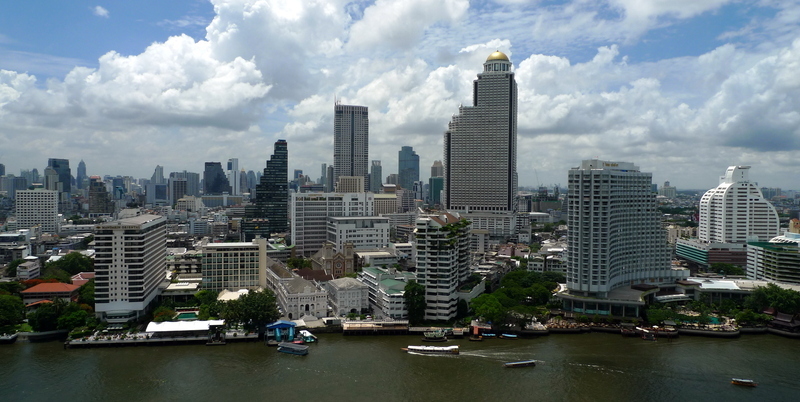 @CurryPuffy – Yes, being on the Thonburi side makes quite a difference. The bedside controls were nice, but they no longer have control over individual lights. For example, if I want just the desk light on, I couldn’t do that. Very bothersome…@M_1 – Sure haven’t gone wrong at any of them yet! Of course, this was the first Peninsula I’ve stayed at. D’oh! @Dezinerdreams – Sounds like you could use one. X)@stevew918 – Tawn is making some changes to his working schedule starting in July and I hope (fingers crossed) that it will make it a little easier for us to do weekend things like this. @foggysunnymorning – Sure was. @lil_squirrel4ever – HMV in Hong Kong, too. Piracy is so big here in Thailand that all the big music/movie chains save one have gone out of business. It is a good idea to get away from it all from time to time. It is certainly good to get away from the Internet sometimes. Love the photos! I’m so glad you are de-stressed. I’m doing my own vacation away from it all… xanga meet with Zakiah in Quincy and taking my mother along… I have had sticky rice with mango! I can scratch it off my bucket list. I didn’t take a picture but it was tasty (though wasn’t presented as elegantly as in your photo). @murisopsis – Oh, I wish I could be in Quincy, too! Have a fun time. @choyshinglin – That’s so true. Sounds like you had a great time! Do they have something like that in Kansas? Foie gras in the buffet? !That’s awesome!!! Glad you had a good time. If I ever find my way to Thailand, that is where I’ll stay. Looks like a great hotel. wow, that looks like a great staycation! the food, of course, looks amazing. it’s a good thing i just finished my dinner or i’d be starving right now! Makes me miss Thailand even more so than I already had. Thanks for sharing those beautiful pictures! I know tickets are cheap to fly there now……. so tempting! @oldpartner – The Intercontinental down at the Plaza, right? @yang1815 – Yeah, nice touch, huh? 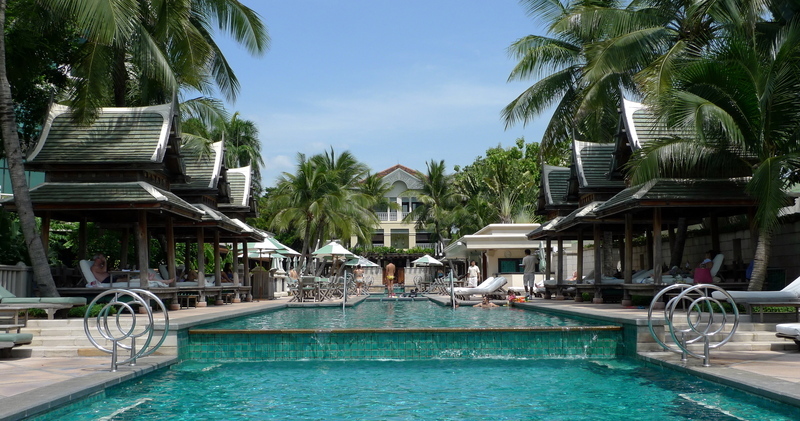 @Fongster8 – Oh, I suspect you’re an old hand at luxury resorts, right David? @Toro69 – There are a lot of nice hotels here to choose from. The Marriott Resort is on the same side of the river but a littler further down river, giving you a true sense of being away from the city. @kunhuo42 – Aaron, it is important to eat before checking Xanga subs…@mOoShimAnGo – Tickets are cheap, rooms are cheap – the country is a huge bargain at the moment. @Senlin – Thanks, it was a nice getaway and we need to take more little breaks like that. That is absolutely awesome. You’re right about the waste in buffet. I like how they manage this. Oh gosh, this entry is making me all dreamy. @ElusiveWords – But not hungry, huh? Hard to believe but I have never stayed at a resort! @christao408 – That just sounds so awesome. I wish I could go to a reasonably-priced buffet serving foie gras!!! The pinkish fruit between the banana and the pear is my favorite fruit in the whole world.I can just eat that all day in place of meals! It’s the thought of getting away from everything with a loved one. I love how you can do that in one of Asian’s premier hotel. 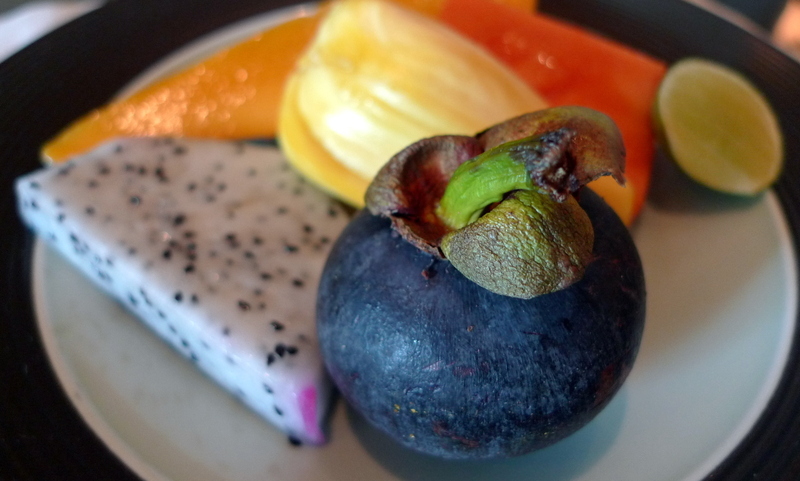 @Wangium – Dragon fruit? @yang1815 – All the more reason for a visit… Actually, if you did the buffet as a walk up, I imagine it would be about $50. Not so reasonable. @ElusiveWords – Yeah, that kind of escape is important. Is that what it’s called in English? 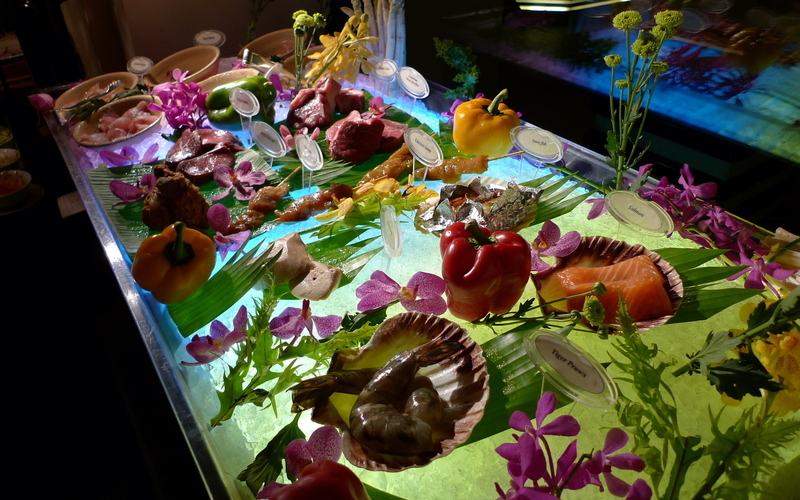 @christao408 – $50 for a buffet with foie gras eh? Hmmm… I’d have to think about that for a walk-up yeah haha.